When I was in high school and college, I regularly volunteered with Habitat for Humanity. Over summers I raised rafters, drywalled, and painted house exteriors on week-long work camps. On Saturdays, I spackled and painted at a local Habitat house. Although I didn't realize it then, these rudimentary construction experiences gave me confidence with the DIY projects I face as a homeowner now years later. Of course, I'm still learning small tricks of the trade. For example, while recently hanging curtains rods I discovered one strategy that makes drilling virtually mess-free. Simply stick a bent Post-It to the wall directly below your drill marks, and the Post-It will neatly catch the dust when you drill. Brilliant. As for those newly-hung curtains throughout our house? 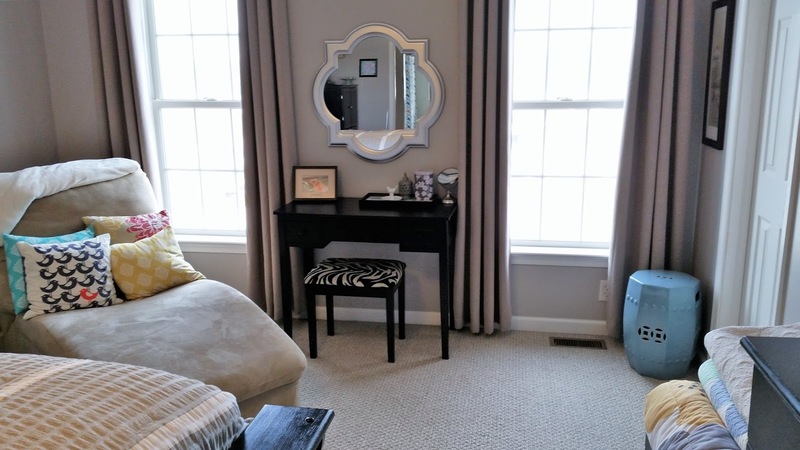 They transformed our rooms, making each space feel polished and finished. (In my husband's words: "It looks like grown ups live here.") Yes, we're finally all grown up. But there was still one minor problem with our newly matured spaces: several curtains didn't drape well at the bottom. Because the fabric was lightweight, the edges billowed outward instead of falling neatly downward. While brainstorming an easy and inexpensive fix, I designed these homemade curtain weights by stacking a few pennies, gluing them together, and adhering them to a paper clip. 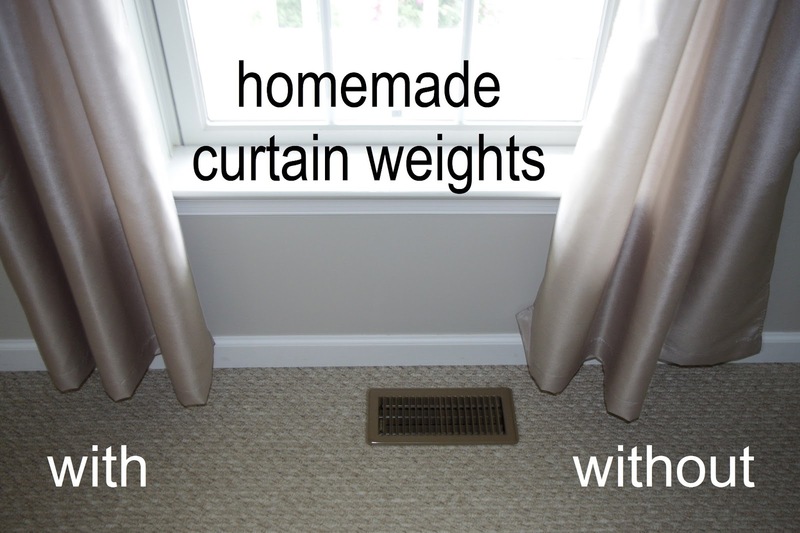 Each weight costs only four cents (literally), and they unobtrusively fasten to the curtain's inner hem. Given that paperclips are naturally malleable, you can bend them to suit your needs. While securing my weights, I simply dropped the weight into the open hem and left one prong of the paperclip exposed on the inner (non-visible) side of the curtain panel. If you look closely, you'll see that I tuck that exposed prong of the paperclip underneath one of the stitches for added stability. 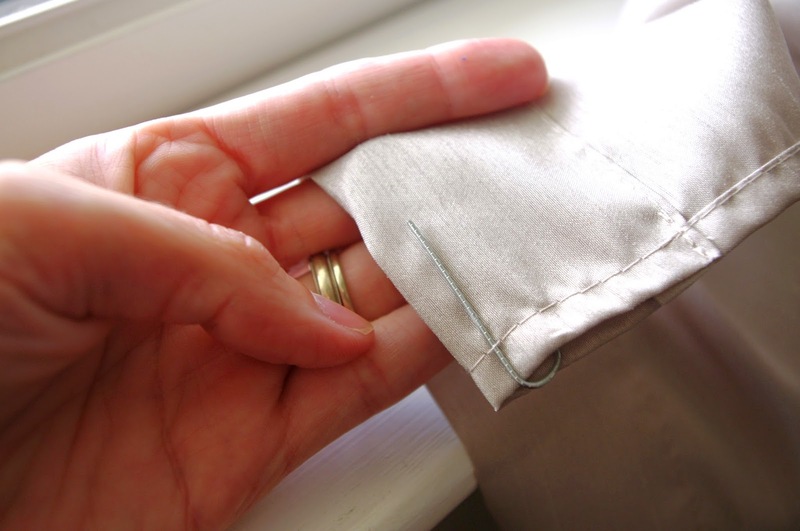 As a final precaution, I also pinch each paperclip tightly closed to prevent the weight from sliding out of the hem. The result is that my curtains now drape beautifully, as you'll see in the picture below. As an added bonus, if I'm ever desperately short on petty change, I instantly know where I can find a stash of coins. 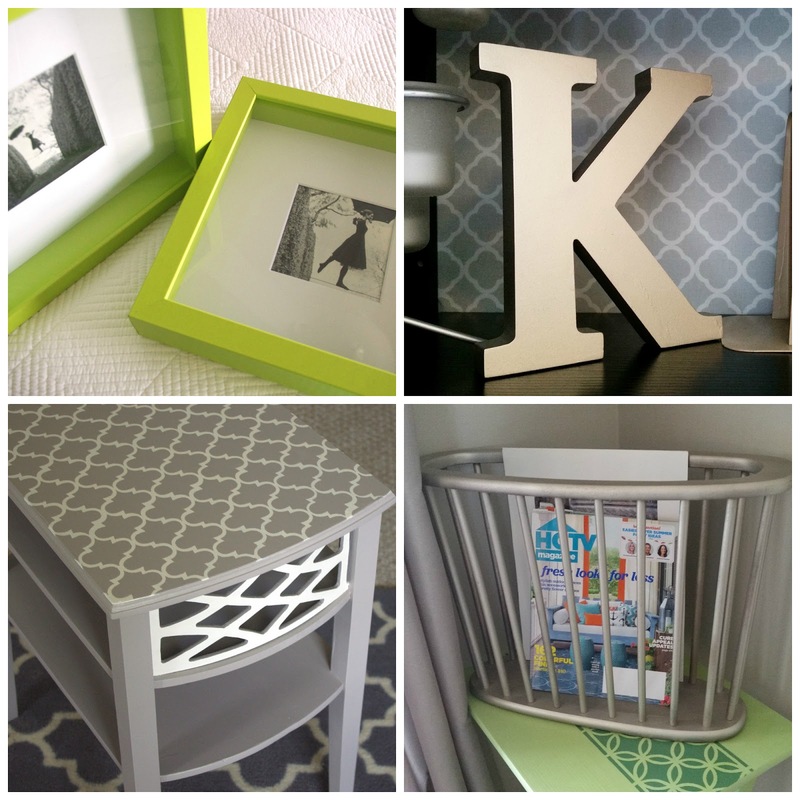 Feel free to explore some of my other favorite DIY projects and hacks below! Want access to regular posts on making your space (and life) more beautiful? 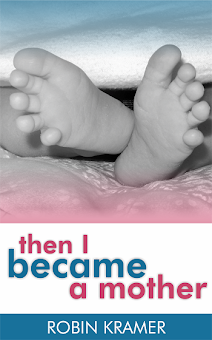 Join the fun and follow Robin Kramer Writes on Facebook! Thank you so much for the curtain weight idea! I just smacked my forehead and thought, "Why didn't I think of that!" They will be added to my curtains today! You're so welcome! Glad that this tip is useful for you! I adapted this great idea and covered coins in masking tape squares and basted into the corners of my sheer white curtains. You could also use fishing sinkers. Super glue will help to keep the paperclips adhered. Anything weaker (like Elmer's school glue or a craft glue) likely wouldn't be strong enough. Thank you!!! You just saved me over 9 dollars! I used body/clothing double sided tape to keep the pennies (10) together and placed them on the inside edge of the hem (the double sided tape keeps it secure). My sheer grommet curtains look perfect! So glad to hear that this solution worked well for you! Thanks for sharing! Pictures of the attached curtain weights are posted for you. I hope that they're helpful! THANKS! I have been trying to find curtain weights that were lead free AND not enclosed in vinyl for my child's bedroom. I'm not a handy DIY or crafty type of person, but this looks like something even I could handle. Will be trying this tonight! So glad that this tutorial was useful and I hope that it works out well for you! How many weights would you need per curtain panel? Would it just be 2, one on each end? Yes, two per curtain panel with one on each end. PERFECT!!! I just did this. $.08 later my curtains look great!! I used the double sided tape as another person suggested. Genius. Wonderful to hear! That's worth an investment of $.08! Pinterest has a lot of instruction on how to properly hang drapes. The weight idea is fine, but oy, those drapes. Not high enough, not wide enough, the rods should extend beyond the window as should the curtain. I'm sorry but I am surprised with all the information available to those without instinct on how to design a space, this still happens. Wow! That seems like a totally unnecessary comment that says more about you than it does her. Hope you feel better now! You (and your words) are very kind, Robyn. Different people have different perspectives, eh? Thank you so much for chiming in! If you can't say anything positive just don't bother saying anything at all. U r such the perfectionist as I am as well. They r quite beautiful.Your idea was so unique. Thank u for simplicity Robin..does the heart good. Great idea, doing this now, thanks for the tip! Any suggestions to hold rod pocket curtains in place on the rod? The curtains want to slide wider than I want them to be. I've been pondering this one for a while, Jenna. Do your curtain rods have screws where the bar connects with the wall brackets? If so, would tightening the screws help? Since my curtains have grommets, I arrange them so one pleat is over the wall bracket, and this holds the curtain in place. This stabilizes the curtains considerably. Hope this helps! I have always used quarter (coin) sized washers from the hardware store for my weights. I'm to frugal to waste US currency. I stitch on the backside of the hem but I think I'll be using paper clips from now on. Thanks for the tip. You're welcome, JoAnn. I'm glad to hear that the paper clip tip is useful for you. 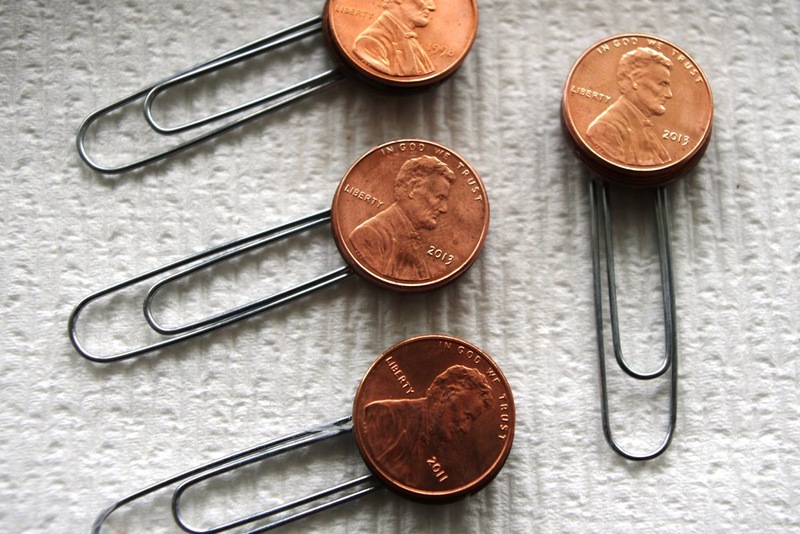 If you’re so frugal, why are you spending more on buying washers that cost more than a penny? Good grief. 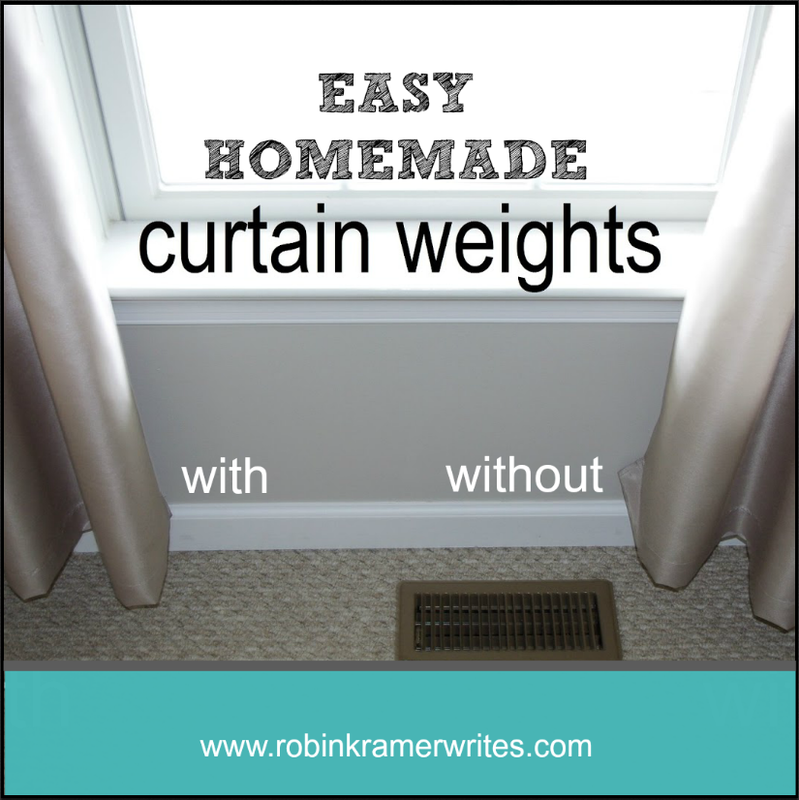 I was hoping to straighten the wavy edges of my curtains with weights in the hem corners, but it seems that it would take more than the weight of a few pennies to accomplish that. Or is there another way to do it?